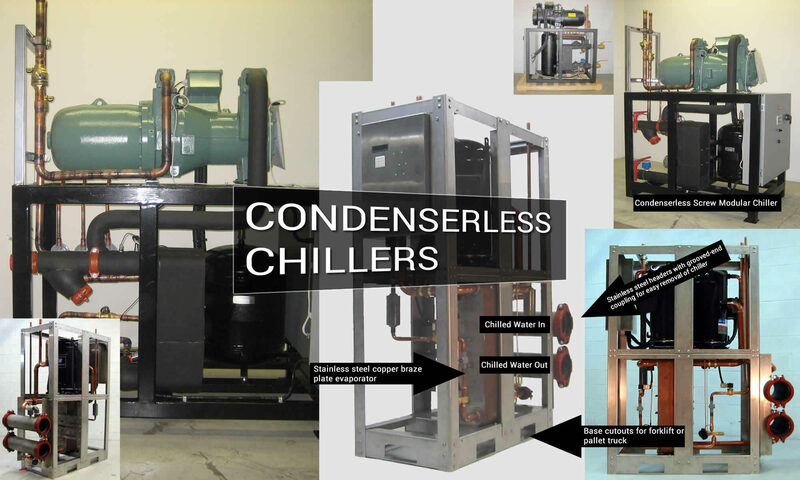 Tandem Chillers Inc. designs and manufactures condenserless modular chillers that are easy to install, easy to repair and will give you significant savings. 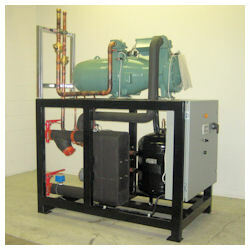 The condenserless chiller is compact in size allowing for easy installation in places where space is severely limited. Models available: WCLX020, 30, 40, 50, 60, 70, 85DZV with dual High Efficiency Scroll compressors. Dual Circuit Stainless Steel Brazed Plate Evaporator. NEMA / EEMAC Type 4/12 Control Panel, optional type stainless 4X. Evaporate certified to UL 207 7th edition and C22.2 no. 140.3-M1987. Stainless steel base frame and supports with galvanized internal supports. Main and branch headers are schedual 10 stainless steel pipe. Models available: WCL060, 70, 80, 90, 110, 125, 140SSY with single High Efficiency Rotary Screw compressors. Frame is structural steel welded frame painted. 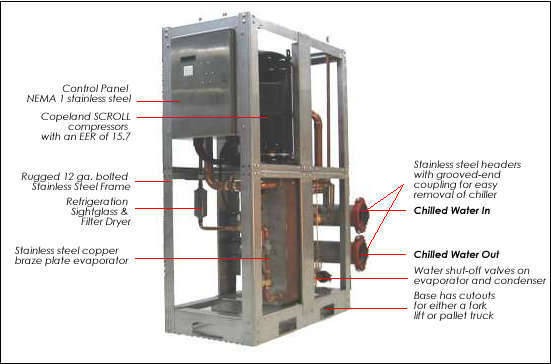 If you do not have access to building supply water (cooling tower water), and dry fluid coolers are not an option, we offer high efficiency modular remote air cooled condenser chillers to be used with our high efficiency air cooled condensers. These condensers can be located on the roof or ground and can be designed to operate in ambients up to 105° F and down to –35° F during the winter months. 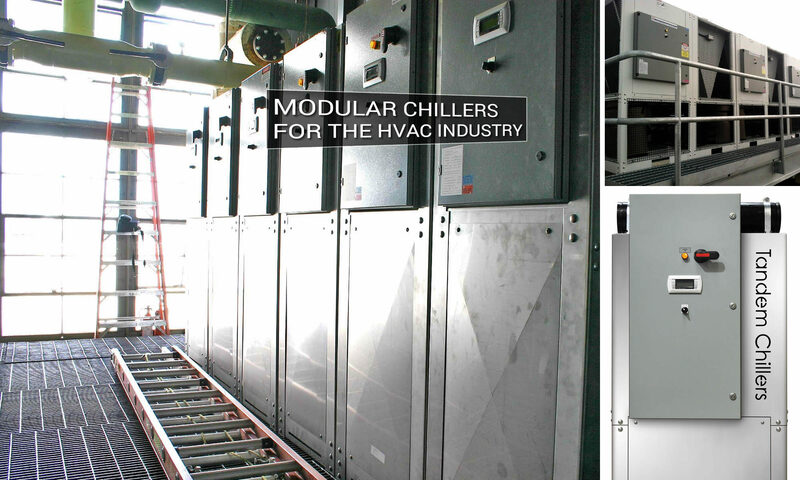 All our remote condenser air cooled chillers feature either Copeland “SCROLL” compressors with dual refrigeration circuits or single Bitzer Rotary “SCREW” compressor with single refrigeration circuit, stainless steel copper braze plate evaporators, stainless steel copper braze plate condensers, our exclusive intelligent chiller control system, and a NEMA 4/12 powder coated control panel.